I’m starting to see a lot of Torino lately. It’s about 250 miles (350 km) from Bologna by train but only about 2 hours and 20 minutes by high speed train and if not traveling on a weekend the round-trip only costs about 40 euros. So I’m spending more time there. 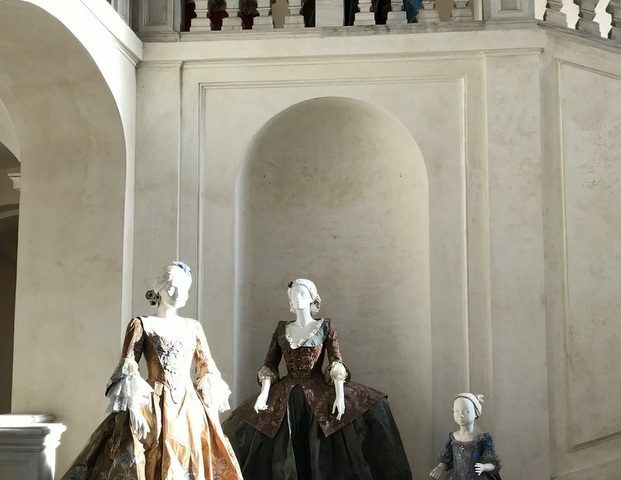 On the last trip (actually the last two trips) I’ve seen some interesting parts of the city and especially one of the several palaces of the Kings of Savoy. 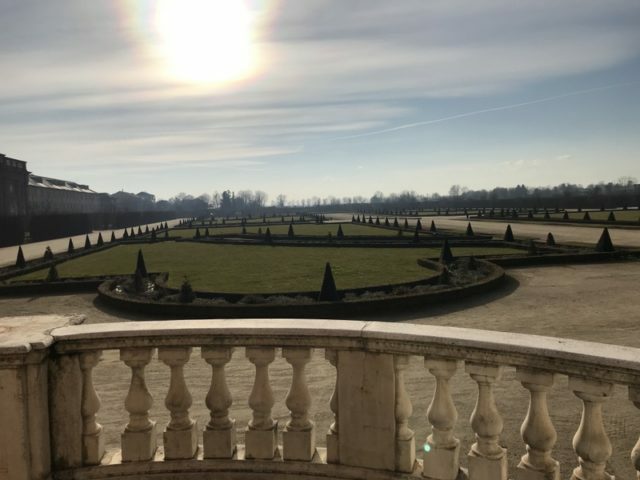 This one, about 1/2 hour outside of the city is called the Reggia di Venaria Reale, which means something like the royal hunting lodge and residence. 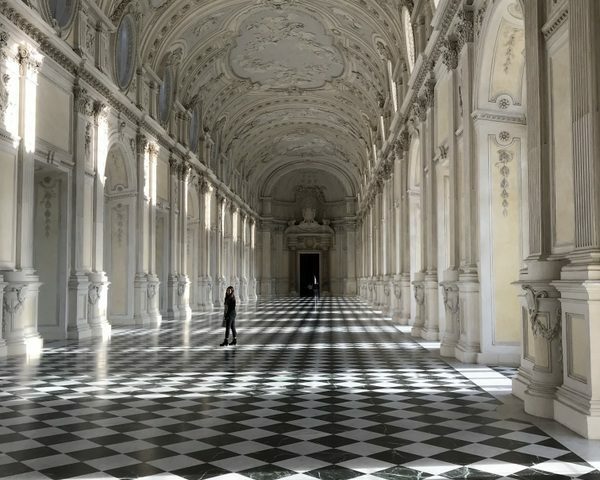 I found it not quite as beautiful from the exterior as the “little” hunting lodge at Stupingi as descrived in that other post about Torino (link here) but it is much bigger, as if a larger palace was really required. There are some things that are particularly spectacular. In fact it’s a bit mind-numbing. Even trying to find pictures on the web is difficult because of the scale of the place. For example square footage of the palace is a jaw dropping 861,000 square feet. This may include the stables (scuderie). I do remember seeing somewhere the stables have the capacity for something like 160 horses. The great hall. Note the woman in the photo to get a feel for the size. The scuderie (stables) now house a major workshop for restoration of national treasures as well as a lot of exhibition spaces as well as the inevitable gift shop. This post is getting pretty long and I have only one other photo. At the cafe with the two Lauras, mine is on the left. The picture above I took at one of the sumptuous and historic caffe’s in the center of Torino. Max and I had a Bijarin, a Torinese specialty consisting of coffee, very dense hot chocolate and topped with whipped cream. 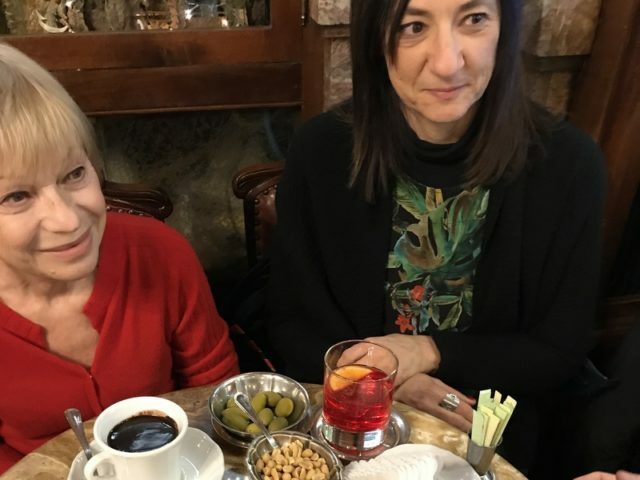 My Laura has just the hot chocolate and the other one has a spritz. 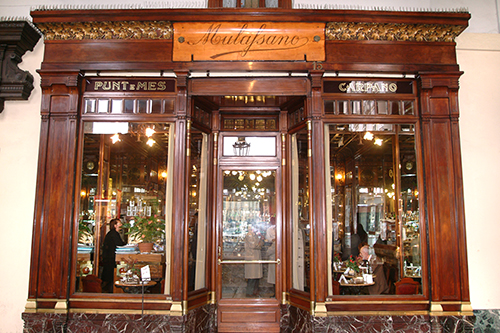 The caffe’ is Caffè Mulassano. Of course I neglected to take photos of the rest of the caffe but took some from their website. 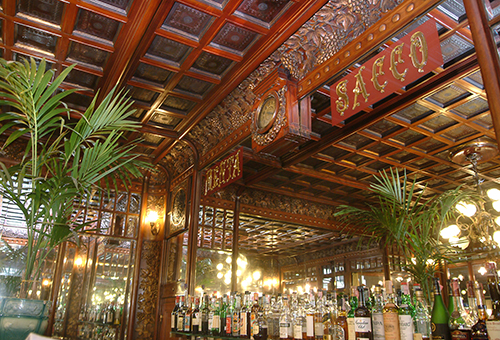 The bar area – note the fantastic ceiling and the clock. 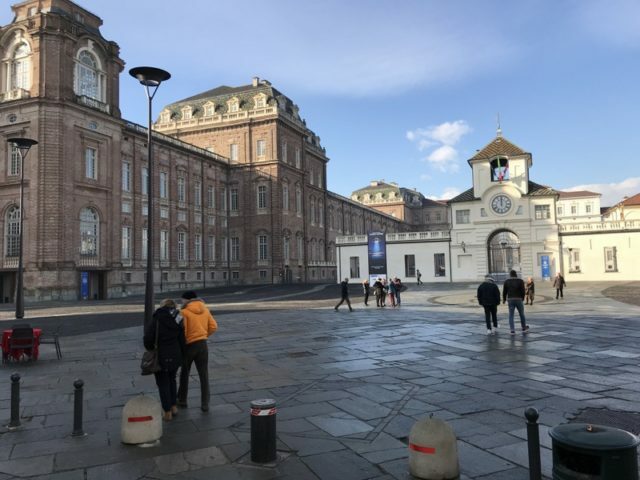 Stay tuned for another post about some spectacular things in Torino. This entry was posted on Monday, January 21st, 2019 at 11:43 am	and is filed under Uncategorized. You can follow any responses to this entry through the RSS 2.0 feed. You can leave a response, or trackback from your own site.